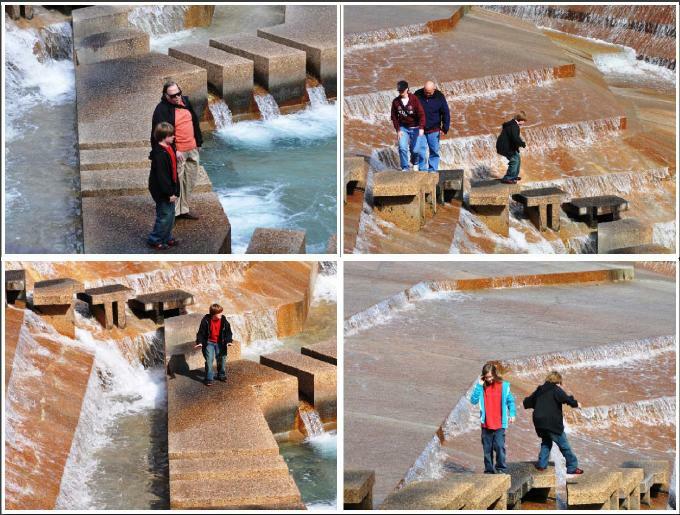 Today, we went to the Fort Worth Water Gardens. 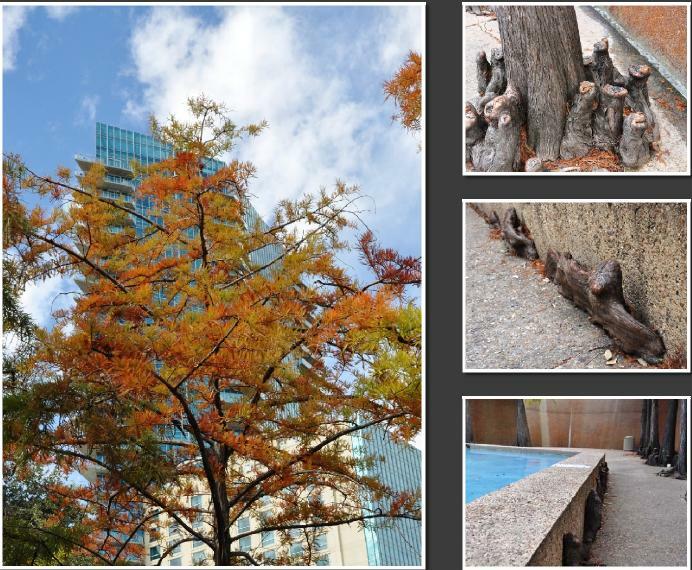 It’s in downtown Fort Worth, right next to the convention center. It was built in 1974 to solve a problem with drainage that the city had. Instead of building an underground drainage system, they decided to take the water and make it into a park. They hired architects from New York City after a contest. 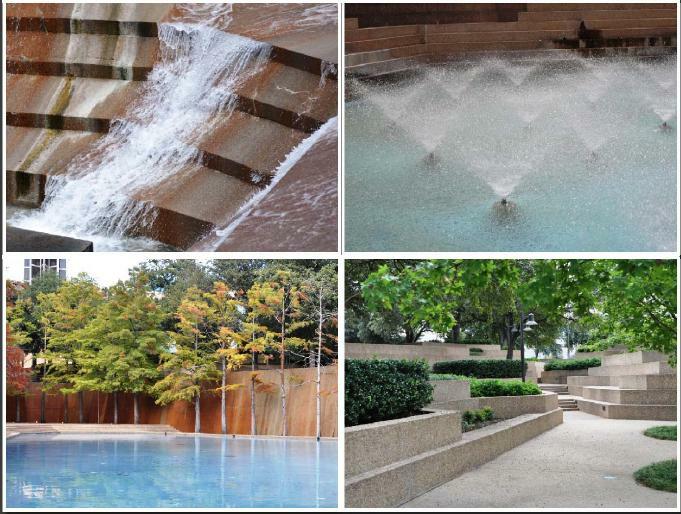 The Fort Worth Water Gardens has three pools, connected by pathways and retaining walls. All the pools are below street level. Clockwise from upper left: the Active Pool, the Aerating Pool, the park & paths, and the Meditation Pool. There are three pools of water, and a concrete wall. There is a meditation or reflecting pool surrounded by cypress trees with a concrete wall that goes straight up. The water runs down the wall in sheets, and then is collected in the pool. The cypress trees have above-ground roots called “knees” that are very strong. They’re tearing up the concrete in some places, and wherever there is a tiny crevasse or crack, they grow up in funny shapes. Another pool is called the aerating pool, and it has all these spray fountains. The signs say that architect Philip Johnson put the sprays at the same height at the walkway, to give the illusion that someone could walk across the pool on the surface of the water. But if that’s what it’s supposed to look like, I just don’t see it. One part of the park is the “Mountain”. You can climb the wall (about 40′), and there are trees at the top. But what the park is famous for is called the Active Pool. It’s 38 feet down from the ground to the five-sided pool, but it seems a LOT deeper than that when you walk down this winding path. It’s noisy and kind of scary, especially since there are all these signs warning that wading or swimming is dangerous, and listing the number of people who have died there since the park opened. But it’s very, very cool once you get to the bottom. It’s like being surrounded by these gigantic concrete waterfalls. The Active Pool is a small five-sided pool. Water runs in very fast from all five sides, and there are concrete stepping blocks that take you down from street level about 50 feet to the small pool at the bottom. It’s noisy and kind of scary. Two science fiction movies – Logan’s Run and The Lathe of Heaven – were filmed in the park. I can see that – it does look kind of like something out of science fiction! I think it’s cool that the city turned something practical – a way to drain water – into a park. We had a lot of fun there, and I want to go back sometime at night when it’s all lit up. I bet it’s really cool then! 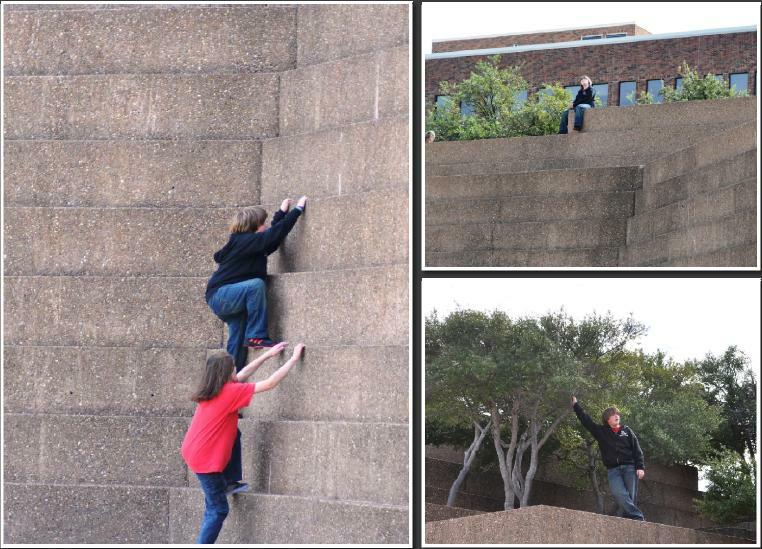 Devin and I had a lot of fun at the Fort Worth Water Gardens today.